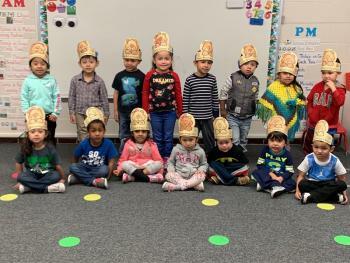 Pre-K students at Hempstead Early Childhood Center celebrated Groundhog Day on Friday, February 1. After learning about the popular tradition, students patiently awaited on Saturday morning to see if the groundhog, known as Punxsutawney Phil, would see his shadow. Students were delighted to hear that he did not see his shadow during the annual Groundhog Day ceremony held at Punxsutawney, Pennsylvania. According to tradition, if the groundhog doesn’t see his shadow, an early spring is on it’s way. If the groundhog sees his shadow, he goes back into hibernation for six more weeks of winter. The students are looking forward to spring and the gardening projects they have going on in the STEM program at HECC.